World Boron Leader Eti Maden has located its quality policy in borates on processing the boron resources in international standards and to bring Turkey a prestigious position in the global arena. It is a trustworthy and industry leader institution in an understanding that meets demands in all processes and responds to high expectations. Eti Maden, which carries out the production of borates in global quality standards by applying the standards of quality, environment, energy management systems, occupational health and safety within integrated management systems; produces high quality, sustainable, innovative and quality oriented products suitable for all kinds of demands and delivers them in a timely manner. Eti Maden demonstrates environmentally sensitive approach to the production activities of borates and aims to bring waste generation to the minimum level. 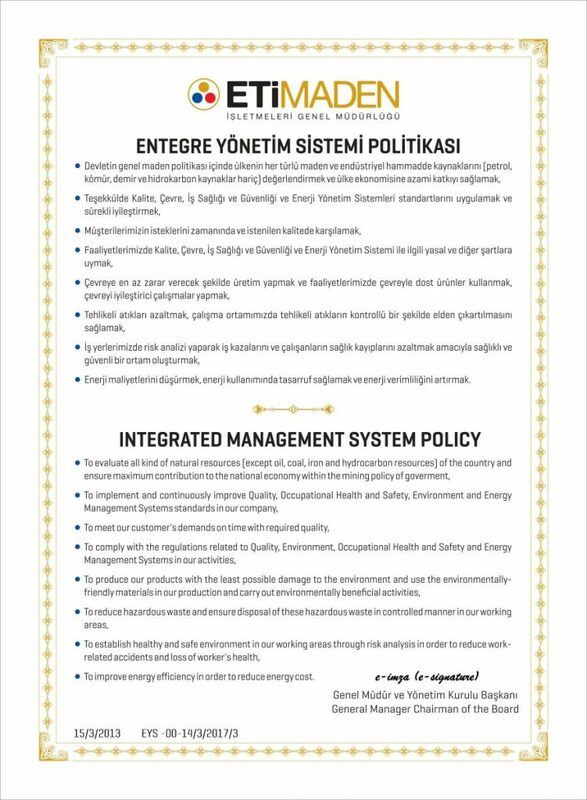 Eti Maden, which makes industrial wastes in the working environment be renewable in a controlled manner, creates a safe and healthy working environment where work accidents and employee health conditions are given great importance by making risk analyses on working areas. Eti Maden, which produces borates in high quality standards, contributes to energy saving by reducing energy usage to minimum level in its facilities.